What started out to be a hobby is now a business. This seems to be happening to so many people lately. It happened to Daniel Sutherland of El Paso Texas. 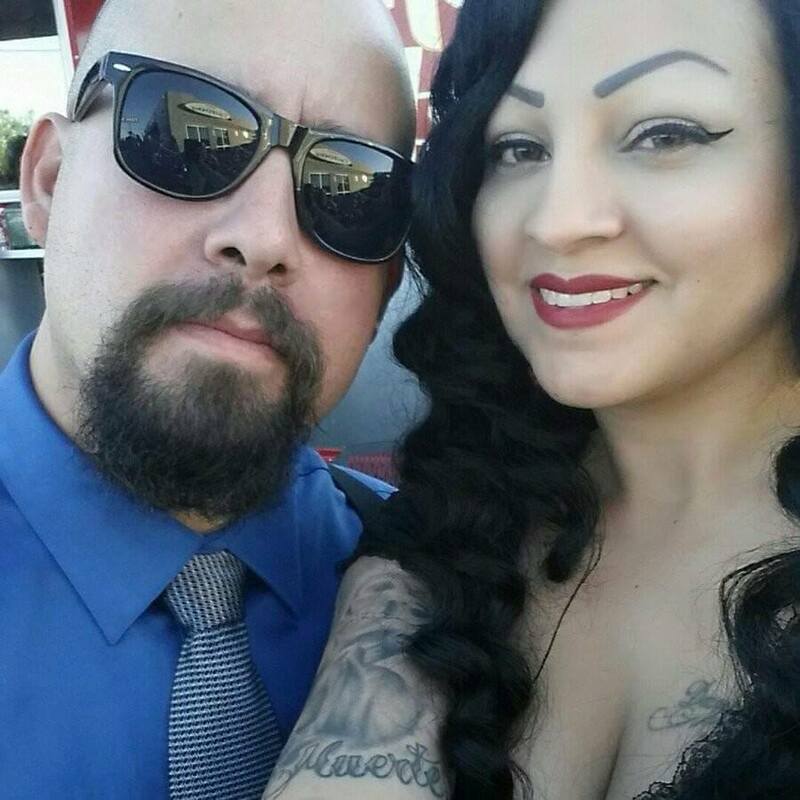 I asked Daniel to share the journey of how he went from hobby to business. I started this journey into wet shaving as a hobby really. I've always like the old school ways and have loved barbering. Once I started wet shaving I found out that there was not a lot of sources around me for gear and such. I began searching online and found a few things. Then it hit me, "I should just make my own." I researched and researched the Web for ideas and recipes to make my own soap. I made a few variations and then settled on a melt and pour soap base. It did well for us and we began selling at our local farmer’s market. Our first market really opened our eyes to see the demand for men's grooming products. We almost sold out our first market! We started putting together wet shaving kits and we could not keep them in stock! We new we had a winner. We have since grown our product line to include aftershaves, shaving cream, beard oils, mustache wax and body soaps! We have recently come up with a new formula to our shaving soap! It is a hot process soap, with a rich, creamy lather and a terrific scent! As far as our logo and name, Diamond Bar Shaving Co. The logo itself was my grandfather's brand from back in his ranching days. I wanted to keep his legacy alive. I'm also studying to be a licensed barber and will be completing school in march. I plan on opening an old school barber shop to educate men on proper grooming techniques. 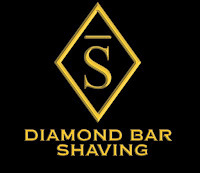 I plan on holding wet shaving classes there in the future also. We will be focusing on the traditions of barbering, to include classic haircuts and hot towel shaves. Making our products has really gotten the whole family involved and had brought us closer, my 2 boys like to get involved and hopefully someday they will be taking over the business. I was hearing good things about his shaving soap and figured I needed to check this out for myself. So I emailed Daniel and he agreed to send me a sample puck. When I open the parcel you could tell this was going to be something special the scent was so incredible. 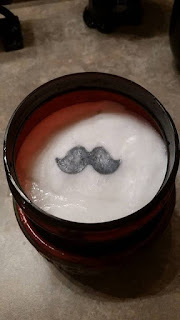 This shaving soap will be ready for market on Feb 24 so a puck was the only thing available to give me but fear not, I was able do some under cover work and get these photos of the final product. As you can see it’s going to be a plastic tub and the cool thing is the mustache center. It’s made with the same soap its just a different color. So cool! The Notes on Vintage - A hint of orange adds lift to the tobacco leaf accord that characterizes this fragrance. Warm tones of oak and patchouli create dimension for the blend as a base of sweet sugary caramel balances the earthy tones. Ingredients: Stearic Acid, Coconut oil, glycerin, Caster Oil, Cocoa Butter, Sodium Lactate, Fragrance and/or Essential Oils. Once I started to bowl lather the scent filled the air. 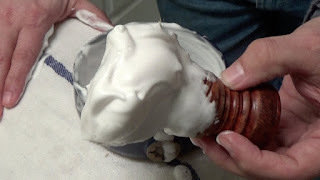 I only added water twice to create an amazing lather rich and creamy with great peaks. Applying it was like paining your face, and with every pass of the brush it was getting thicker. Almost like the brush was creating more of it with every pass. When I was done and ready to shave, my razor just floated right over my face with ease. As bonus footage for the video I wanted to see how many additional times I could lather my face using the same brush with the left over lather. I was able to do an additional 6. (you can see the results in the video) simply amazing.